Update: SSH Port Changed to 2618; Telnet Remains 23. The Basement Theory is a re-envisioning of the dial-up BBS I ran in the 1990s. Originally running in the local-calling area for Scioto County, Ohio and northern Greenup County, Kentucky, The Basement Theory existed under three BBS names: The Cool (1993-94), The Basement Theory (1994-95), and A Saucerful of Secrets (1995-97). “The Basement Theory” is surely the most remembered name by the old users, and is why it’s the “new” name, today. The current version of The Basement Theory borrows from old backups of the original BBS to create its theme and attitude. 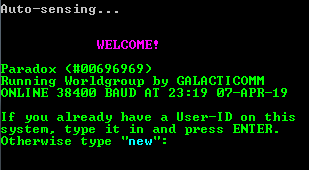 Much of the old data is available to view or download from the BBS. In fact, the current ANSI menus are the same ones as used on the BBS in September 1995, according to the file dates of the backed-up ANSIs. Of course, even though the board is an admitted exercise in nostalgic self-indulgence, The Basement Theory‘s main goal is to be a contributing part of the current BBS scene. It belongs to DOVE-net, FidoNet, and Agoranet, in case you’re looking for a node to participate in the BBS message networks. It also runs several door game favorites, including games still being developed, like Rick Parrish’s modern port of Usurper. There are even new, ongoing archival projects, such as the Animation File Archival Project (GL/FLI/DL) and the Exec-PC Graphics Archive. So, why not come be part of a new community? Visit The Basement Theory today! Connect to Basement Theory Now!